Please join us in congratulating Dr. Anthony McGoron who has been promoted to Professor of Biomedical Engineering at Florida International University. Dr. McGoron received tenure and promotion to Associate Professor at Florida International University (FIU) in 2005. Since then, Dr McGoron has exhibited an outstanding record of service to the University and his profession, demonstrated excellence in teaching and had a high quality research program. He also served as interim Chair for the department from 2007 to 2010. Dr. McGoron’s area of research is targeted drug delivery for treating cancerous tumors. He is accomplishing this with development of theranostic agents, that utilize molecular imaging to identify the target and nanoparticle based drug delivery to accomplish the therapeutic effect desired. Dr. McGoron’s breadth of knowledge and experience in pharmacology and cell biophysics, molecular imaging and biomaterials is allowing him to conduct this discovery-based science and develop the novel agents for clinical delivery. He was recognized as a “Top Scholar 2011” by FIU.. In 2011, Dr. McGoron was elected National President of the Alpha Eta Mu Beta (AEMB) Biomedical Engineering Honor Society. He was also awarded the national outstanding faculty advisor from the AEMB. The same year he was recognized by the College of Engineering and Computing with the Outstanding Service Award. Dr. McGoron, has also been an excellent teacher and mentor to multiple graduate and undergraduate students. Many of them have published manuscripts and have received multiple national accolades. He has also been an excellent mentor to junior colleagues and research scientists. One of his postdoctoral fellows graduated to a Research Assistant Professor position at FIU and will now be a faculty member in India. In recognition of his mentorship effort, Dr. McGoron received the FIU “2013 Faculty Award for Excellence in Advising and Mentorship”. Dr. McGoron has been a leader in development of curriculum. As Director of Undergraduate Studies, he has revised the curriculum for undergraduate education and has helped shape it’s “track” organization. 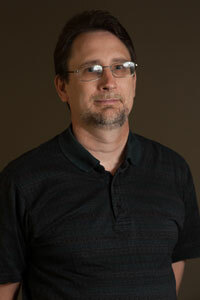 He has played an important role in the design and development of the Senior Capstone Design course for the department. Dr. McGoron’s role as an educator is not limited to that in Engineering. He has been in the forefront of interdisciplinary education, helping develop the Q’BIC program, an NIH funded training program that brings quantitative skills to the biology curriculum. In the Honor’s program, he has helped improve the research experience of undergraduates and held summer workshops for the Q’BIC program. The service provided by Dr. McGoron to the department, University and the profession are outstanding. We are delighted with his success and proud to have him on our faculty.